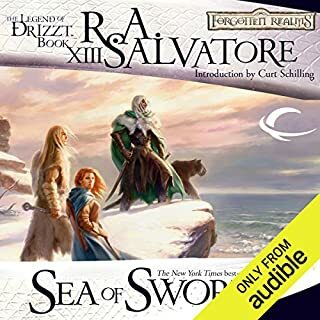 A new audio edition of the New York Times best-selling sword and sorcery classic, The Legacy is Drizzt at his scimitar-wielding best! 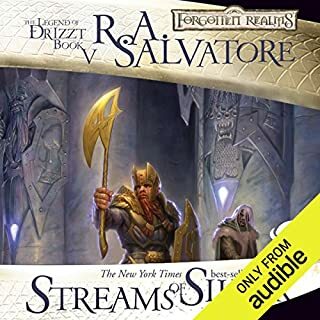 ©1992 TSR, Inc., 2006 Wizards of the Coast, Inc. (P)2013 Audible Inc. The only downside is the narrator reads dialogue much much louder than everything else. I usually listen to books while I lay down for the night so I had the volume up enough to hear his whispering the words then getting to a normal bit of dialogue and yelling. there's not much in-between....just whispering then yelling. A bit wordy at times it doesn’t need to be and some fights sound like copy and pasted battles from other chapters. 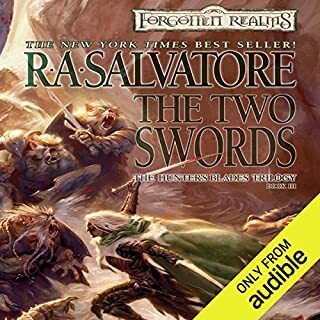 The story is ok. It’s my first R A Salvatore book so I’m unsure if it’s this story or his style. There’s a great deal of unconnected dots which I am left having to assume are explained in further stories in this series. I’ve used a free token for the next book and will hold my judgement up or down from 3 stars until I finish that. 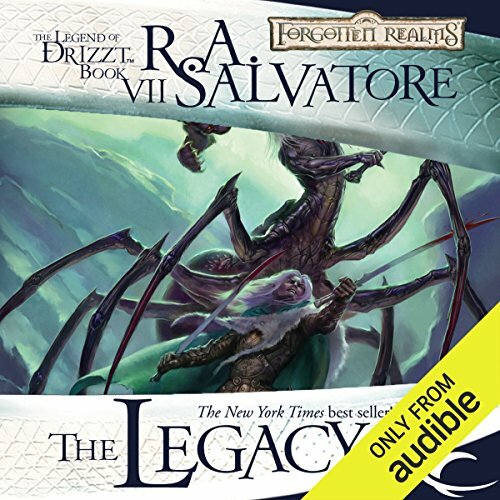 Legacy is the seventh book of the Drizzt Saga and the first of the Legacy of the Drow Series. All the previous stories in the saga are great but it wasn't until this series that the conflicts took battles to an epic scale. As always the action sequences are amazing and the suspense will keep you on edge. The cast of characters is incredibly diverse and the narrator does a tremendous job giving each one their own voice. This is Sherlock Holmes meets The Return Of The King. 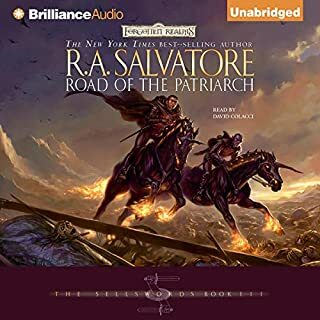 Just remember if you skip the previous novels you may feel a little lost at first but Salvatore does a pretty good job in bringing people up to speed. 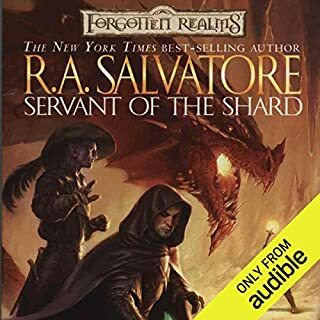 And fortunately despite only having this book Legacy on preorder, audible is offering the complete series for sale on the day it was released. I recommend the whole series for anyone interested in books that take place in fantasy settings from age 8+, it does have graphic fight sequences but it lacks the gorey details. What did you love best about The Legacy? 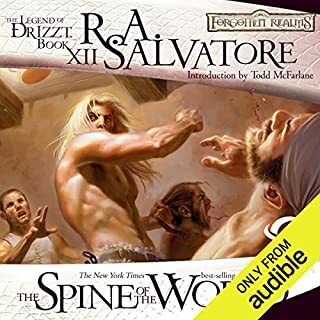 The way R. A. Salvatore weaved the story together like a jigsaw puzzle, fitting each piece perfectly as he brought the story together. I was a little worried at first. I thought maybe Mr. Salvatore had lost his touch, as some of the characters weren't behaving like they normally do. But as I stated, like a jigsaw puzzle, with each piece connecting, things started to make more and more sense as Mr. Salvatore weaved his story together like a masterpiece painting. What was one of the most memorable moments of The Legacy? Wulfgar, Catie-brie and Bruenor's battle with the yochlol and the drow party from Menzoberranzan. It was a very powerful and emotional moment. I have listened to all of Victor Bevine's previous narration of this epic series. And once again, he does an amazing job. 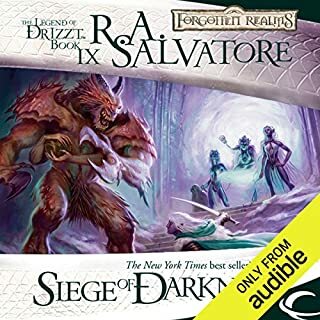 I can't imagine anyone else voicing Drizzt Do'Urden but him. I've gotten to the point where I hear his voice while reading the books in the series, when I am not listening to it that is. Yes, it was tough to stop listening. In fact, I had to buy the next book in the series right away after this one. 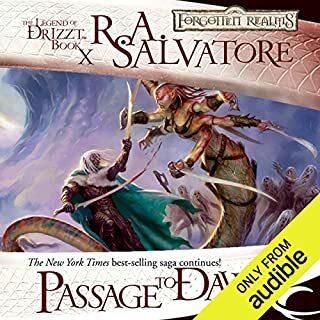 I thought I would have to wait for the next book in the series, like I had to wait for Audible to release this one after the Iced Dale Trilogy, which I admit was a tough wait. But to my surprise, Audible release all four books to this series on the same day. Celebration!!! 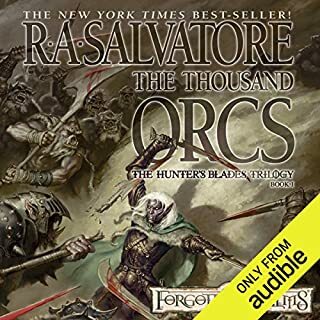 Good job to Audible. A must read pivotal game-changer In the series! 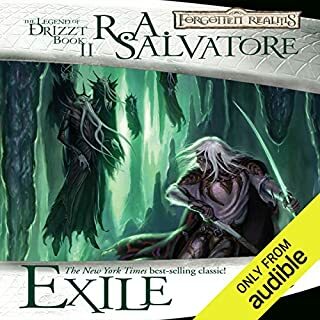 If you follow my reviews, especially for Salvatore’s Drizzt novels, you know that I rarely, if ever, provide plot points or spoilers, as I feel they take away from the listening experience. 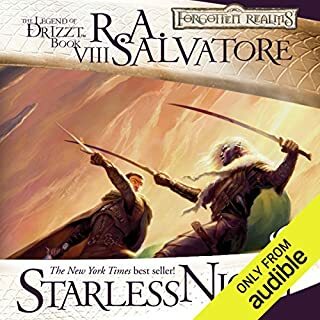 In this case, however, it’s important to place this audiobook in respect to Salvatore’s previous rich and noteworthy Drizzt novels. 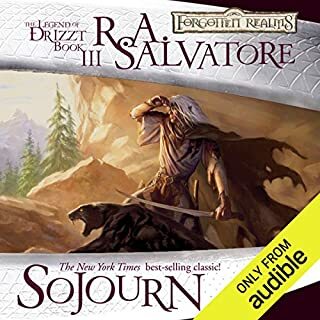 This first of four novels in this series occurs after Drizzt’s exploits in the Icewind Dale trilogy. 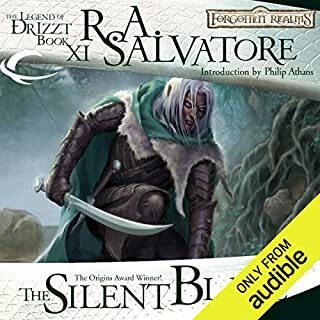 This solidly-written Turtledove novel confronts the consequences stemming from Drizzt’s sister and her dark elven disciples that ascend from the Underdark. 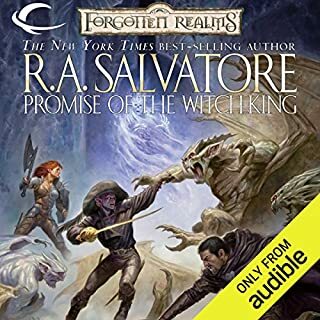 Their plot to seize him, and then sacrifice him to Lolth, the Spider Queen Goddess, is only the very beginning of where these four novels will take you, dear Audible listener. MAJOR events occur in this first of the four Legacy novels. Surprising ones, at that. VERY unexpected turns of events. What you THOUGHT you knew from the previous novels isn’t necessarily the case. Strap in, and get ready for a great ride. 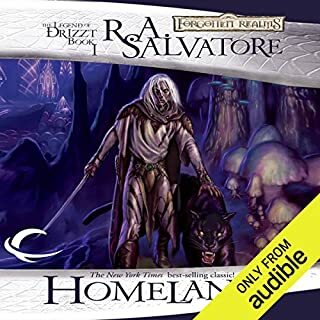 As to Salvatore’s writing style, this work is a less “by the numbers” storyline than his previous Drizzt novels. That by no means takes anything away from those earlier strong efforts – They were groundbreaking works in fantasy that further defined the genre. This work, however, truly stands apart, and it makes for a great listen. It’s a cut above, and it shows. Rivalries escalate. Characters take an growing prominence, and hint at further storylines in subsequent novels. Strong plots lines and events launch herein, so I have to stop here. A final note: Victor Bevine does a solid job of narration, and definitely adds to the work. 80% action, 20% story. Disappointed. Vierna by far. Drizzt's sister is pure evil, hell bent on his destruction. Very fun to read her scenes. What aspect of Victor Bevine’s performance would you have changed? I'll probably always give Mr. Bevine 3 or 4 stars. 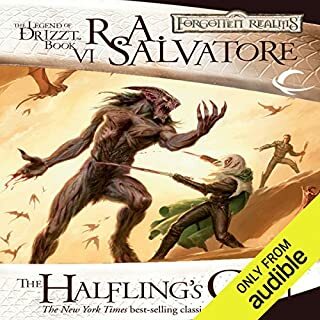 I know other folks like him and fans voted for him to narrate the Drizzt series of books, but I personally don't like his tone. His normal voice during non-action scenes is almost a whisper. It's very strange. Then, when the action starts, he raises the voice much higher and increases the pace, and I'm usually forced to change the audio up and down. There's better narrators out there; I wish someone else would take on the books and put a better spin on them. Yes, but if I even hint at what it was, it would be a spoiler. Suffice it to say, you'll be cheering, laughing, and sad while reading this book. 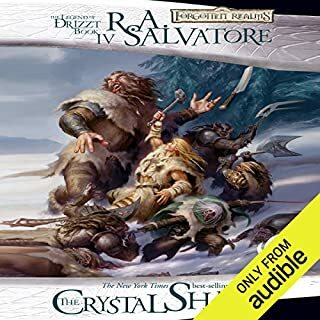 I always liked the Drizzt stories, you can't go wrong with them. Highly recommended, especially if you don't mind the narrator's odd whispering tone. This story felt very contained and not the sprawling adventure dizzy usually has. It felt as if the fight in the cave was literally the whole book. Well, it kind of was. the story and narrator are great, but the volume is not well mastered. there are times when the narrator whispers and the engineer does not match the volume across the track. Although book one this story is WELL underway!! Wouldn't suggest you start with this book, after a few chapters I realized this is a story that is well under way and starting here would be like walking into a movie during the last 45 min. And trying to understand what's going on. Sounds like a good story tho! I wish it was clear where this story actually begins! 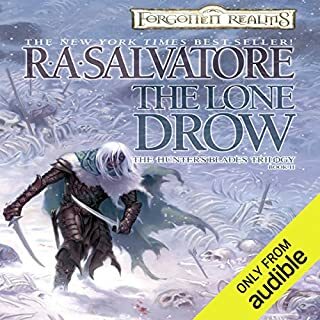 This book ties up loose ends family wise.Drizzt sees a spark of light in his sister Buena but she is too far gone to be saved.Wulfgat's macho domineering attitude wears thin but his death is surprising.Artemis Enterari is obsessed with besting Drizzt but loses . lost a lot of sleep lissing to this story!